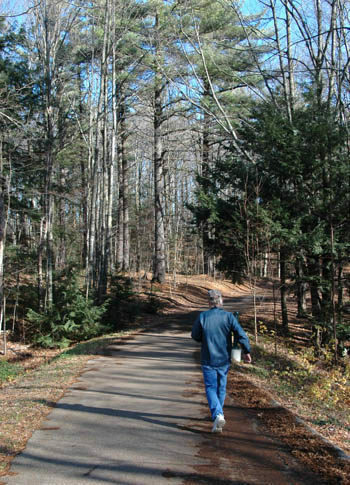 Aspen Park has five short trails that are paved and total 2 miles. The perimeter of the route, Elk Trail, North Trail and Hemlock Trail, form an easy 1.65-mile loop that begins and ends at the information kiosk in the parking lot. The asphalt surface makes this loop ideal for walking, family outings with young cyclists, in-line skating or roller skiing in preparation from the upcoming Nordic season. 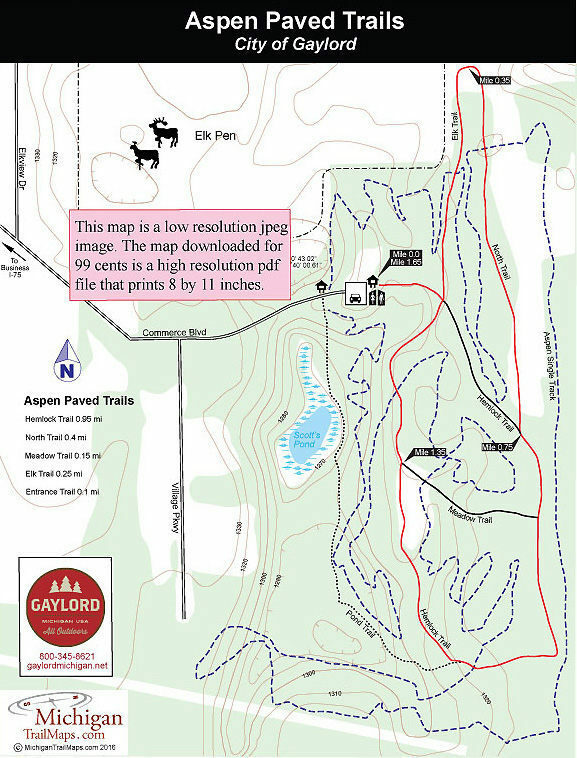 You begin with a short connector trail that enters the woods and quickly arrives at a major four-way junction with Hemlock and Elk trails where there is a bench and a posted map. Head north (left) to follow Elk Trail through the woods and then into an open field where the paved path parallels the city’s Elk Pen. Occasionally you can see some of the herd but they are usually out-of-sight, preferring the northern half of the pen. The best place to look for elk is the Elk View Area at the corner of Grandview and Elkview roads east of Old US-27 or behind the City of Gaylord Public Works Department off of 7th Street. At Mile 0.35 Elk Trail passes one of two mini-shelters in the park and then swings south to become North Trail. You enjoy a mix of fields and then woods before arriving at the junction with Hemlock Trail at Mile 0.75. Continue south (left) to follow Hemlock Trail for almost a mile as it loops to the south end of the park, along the way passing a pair of junctions to Meadow Trail, a crossover spur, and some impressive hemlocks. At Mile 1.55 your return the four-way junction with Elk Trail where you would head west (left) to gently climb to the parking area. For something shorter you can simply stay with the Hemlock Trail as it loops through the heart of the park for a outing of only 1.15 miles. Aspen Park features a parking area with an information kiosk, a vault toilet, and tennis courts. Along the paved paths are trail maps, benches and mini-shelters. The park is open dawn to dusk and there are no entry fees. From I-75, depart at exit 279 and head north on Old US-27. At the K-Mart Store, turn east on Commerce Boulevard and follow it a half mile to the park entrance. Contact the Gaylord Convention and Visitors Bureau (800-345-8621; www.gaylordmichigan.net).